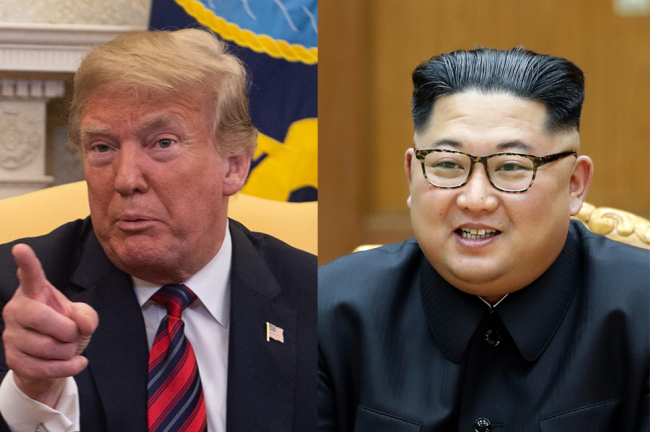 Signs of North Korea and the US trying to form a conciliatory mood are detected in the lead up to the historic summit between North Korean leader Kim Jong-un and US President Donald Trump to be held in Singapore on June 12. North Korea has tapped a more moderate defense minister in an apparent attempt to stave off potential opposition ahead of the pivotal summit with the US, Japan’s Asahi Shimbun reported Sunday, citing an unnamed source with knowledge of North Korean affairs. No Kwang-chol, head of the second economic committee at the Workers’ Party and first vice minister of the Ministry of People’s Armed Forces, was chosen to replace Pak Yong-sik as the minister of Pyongyang’s armed forces, it said. Pak, who has served as defense chief since May 2015, accompanied North Korean leader Kim Jong-un to the inter-Korean summit on the border village of Panmunjeom on April 27. He is on the United Nations Security Council’s sanctions list. “Bringing moderates on board (in the military) is apparently intended to rein in the possible opposition in the military as a result of the dismantling of North Korea’s nuclear weapons,” the report said. The paper also reported that Ri Myong-su, chief of the KPA’s General Staff, had been replaced. In the North Korean military, the General Political Bureau is responsible for giving political guidance to the military, while the General Staff is tasked with overseeing combat operations. The Ministry of People’s Armed Forces handles general administration and logistical coordination. In May, Army Gen. Kim Su-gil, who was mayor of Pyongyang, replaced Kim Jon-gak as director of the General Political Bureau of the military. No and Kim have been widely seen as moderates in the military. But some suggest that the reshuffle is not intended to replace hardliners with moderates, but to push for the regime’s shift in focus from nuclear weapons development to economic development. North Korea said it is “the strategic line of the Workers’ Party of Korea to concentrate all efforts of the whole party and the country on the socialist economic construction” at a plenary session of the ruling party in April. Meanwhile, in the US, hardliners on North Korea were not seen accompanying Trump when he greeted Kim Yong-chol, vice chairman of the ruling Workers’ Party’s Central Committee and North Korean leader’s top aide, in the White House. Kim, a former spy chief on the US sanctions list, flew to the US to have meetings with US Secretary of State Mike Pompeo in preparation for North Korea-US summit. In Washington, he delivered a letter from North Korean leader to Trump. Trump’s national security adviser John Bolton, and Vice President Mike Pence -- both hawks on North Korea -- did not take part in the meeting and were not seen around. Their suggestions that North Korea should follow the “Libya” model for denuclearization angered Pyongyang, leading it to put out statements threatening to cancel the meeting with the US. Libya voluntarily gave up its nuclear weapons program in 2003 in exchange for the easing of sanctions and normalization of relations with the US, but its leader Muammar Gaddafi was killed in 2011 by rebels aided by the US. Trump has been seen keeping a distance from the “Libyan model” recently in an apparent attempt to appease North Korea worried about its regime security. It spawned speculation that Bolton’s standing has weakened in Trump’s foreign policy team.